However this week I am happy to say that I have now been blogging for a year! Woo mini party! As a celebration I am aiming to get 100 likes on my Facebook page - so if you like to read my blog and would like regular updates, please like my page and share it with your friends! 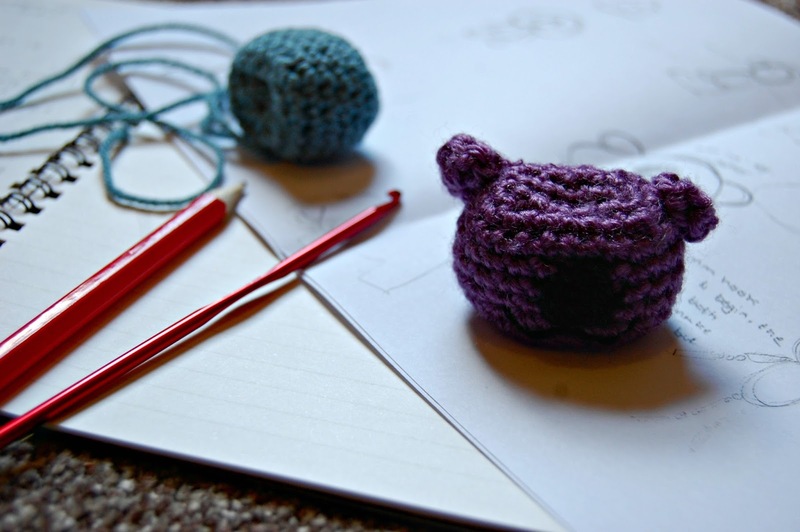 As is usual now lets take a look at how I managed to get on with my crafty plans for March. 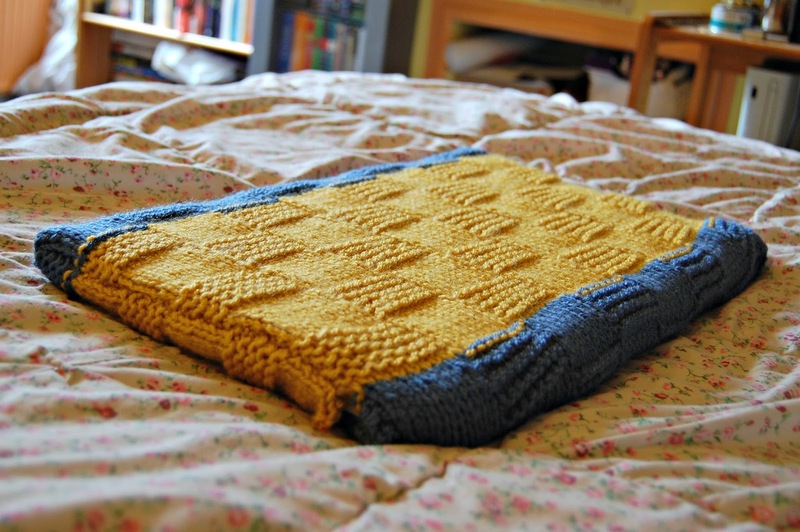 I completed a knitted laptop sleeve last week which, initially, I was a bit disappointed with. It is quite flimsy and stretchy and I really need a cover that is tight fitting and sturdy. As time goes on though it has definitely grown on me! I'm really pleased that I stumbled across this lovely pattern over on Handcrafted Vintage and it is a great pattern for just protecting my laptop while it is in my room. I am going to sew myself a quilted cover that will offer the protection I want, and I decided after this knitting experience that a knitting fail is a lesson learned! I don't feel as if I achieved as much this month as last month, but I'm still pretty pleased with what I am achieving! Have you made anything you are proud of this month? 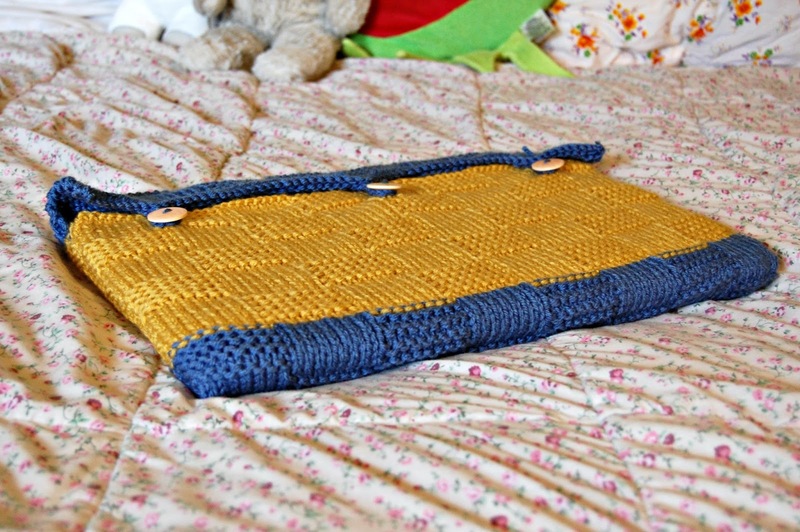 As I promised to you, and myself, I finished knitting a laptop cover! I have very mixed feelings about this project - why don't you read on and tell me what you think. 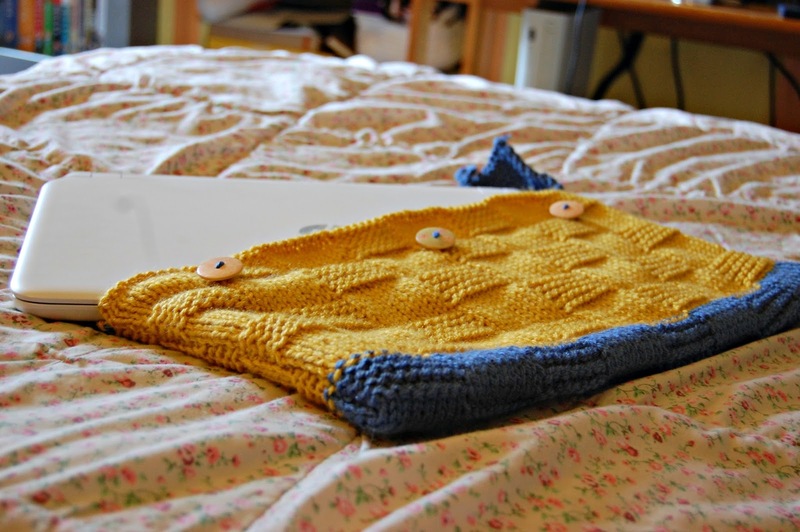 You can also read about this laptop sleeve on my Ravelry project page. I found the pattern on Ravelry and thought it was a splendid, tasteful and simple pattern with an effective colour combination. I promptly printed it off and got started. I've sort of made a private promise to myself to not buy any more yarn for a minimum of 6 months starting in January (I had a tiny slip in February, but it was £3 for 3 balls so I couldn't say no!) so I needed to use up something in my stash. This limited my colour choices somewhat but I was pretty happy with the yellow and blue. It does look a little too Despicable-Me-minion for my liking, but I think I get away with it! The original pattern is for a 13" Macbook Pro; I have a 15.6" HP Pavillion, so I knew some adjustment would be needed. The pattern is worked in blocks of 8 stitches so I had no choice but to add 8 stitches when I cast on even though I felt fewer would be better. Its a great pattern that works up reasonably quickly and looks very smart and effective. I did get rather bored of knitting the pattern I must admit and it became one of those projects that I forced myself to finish. If I put it down I had a feeling I wouldn't pick it up again! I also needed to work 2 further repeats of the pattern because it was impossible to tell if it was long enough. I worked it extra long to develop a flap to ensure it would cover and protect my laptop, worked in the contrast colour to avoid the minion appearance. When I finished the cover I must admit I really did not like it at all. It doesn't look as neat as the pattern picture, and it is too big for my laptop even though I sewed the edges together more in the hopes of tightening the fit. But I slept on it and when I woke up I did like it more. My main problem with the sleeve is that it is so flimsy and slips all over the place when I try to pick up the laptop. But I know it is mainly my expectations which make this laptop sleeve appear less than adequete; I want a firm, tightly fitting case which will protect my laptop snugly. This can't really be achieved with knitting/crochet for such a large piece of hardware. So I'm continuing my sewing fix from the weekend and instead I will sew a case (as I am loathed to buy one with all the crafting supplies in my life!) which should give me a much sturdier cover. I will use a zip or Velcro to make a secure fastening as well. This pattern is good and I would recommend it for a simple straightforward gadget sleeve, but it is in my opinion more suited to a small, light laptop or a tablet/e-reader. 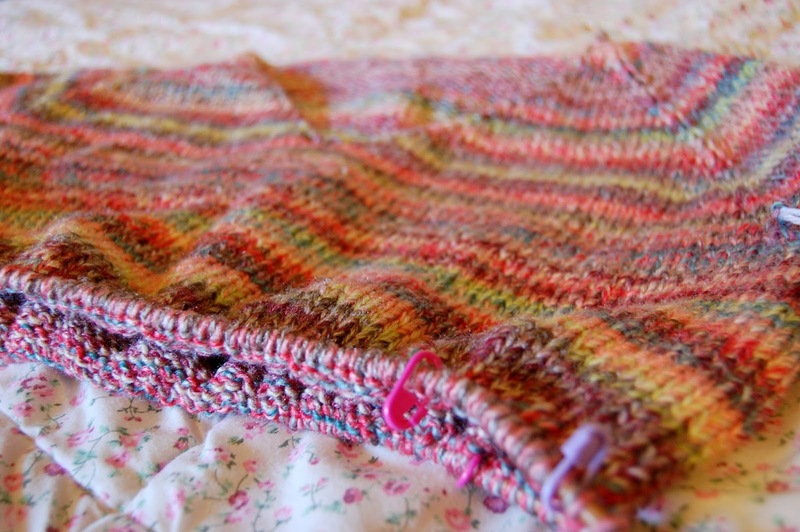 And I'm not upset that I don't like my cover - a knitting fail is a lesson learned! 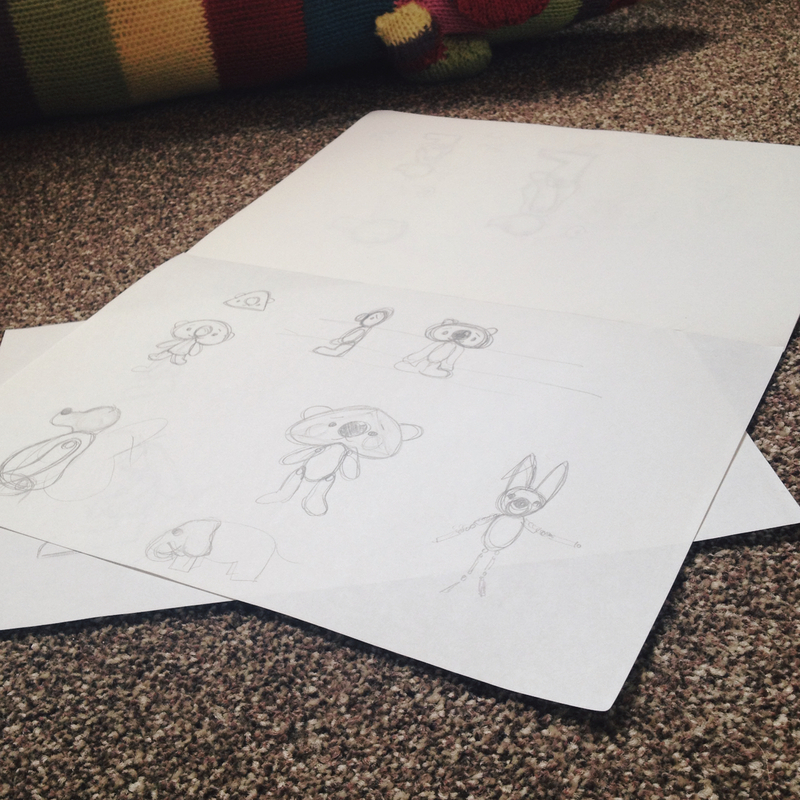 Since starting this blog I have no misgivings in admitting that I have been thrilled with how my personal creativity has thrived, or at least how I have felt it grow. Ideas keep jumping through my mind all day long –to the point that I do occasionally get frustrated at the amount of things I want to try or do! But this frustration is well worth the renewed sense of enthusiasm I gained from writing this blog and from starting to write my ownpatterns. 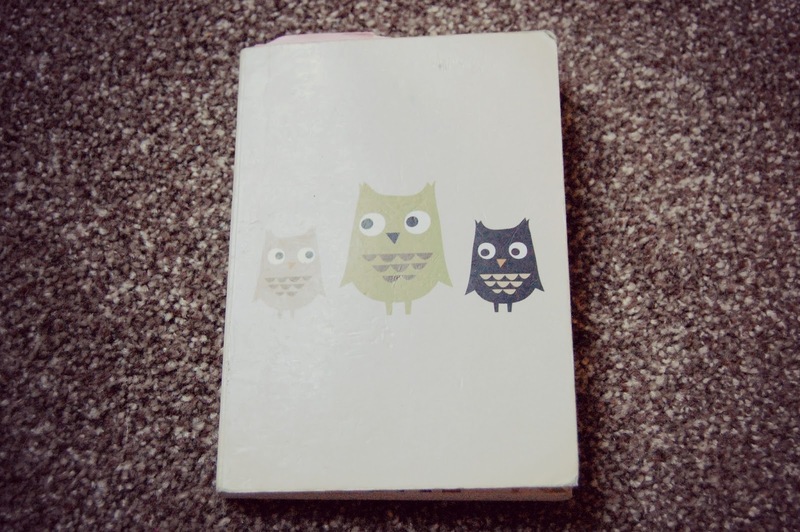 Having so many ideas and thoughts has made me realise just how important carrying a notebook around with me has become. Every time I have a new idea I quickly scribble it down in the book in the hopes that I will remember it later and act upon it. 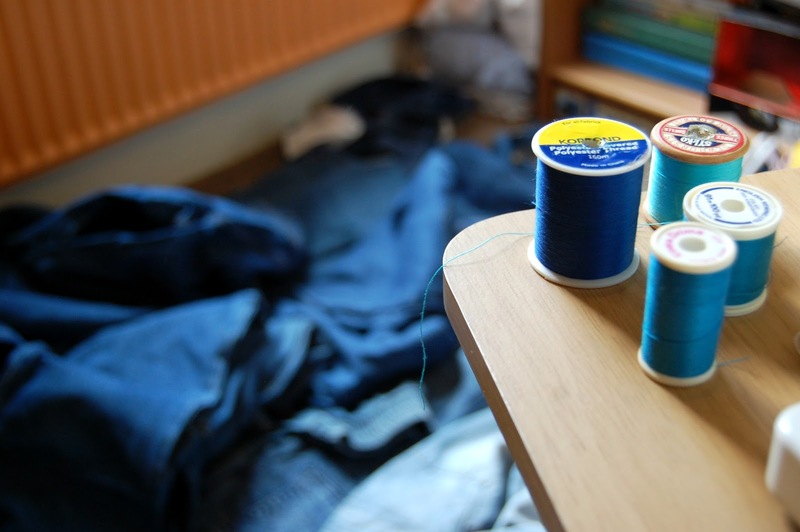 Of course there is so much to do (dangers of the internet and the allure of Ravelry and Pinterest) and many of the ideas I jot down do end up forgotten, no matter how many post-it notes I stick in my book that read ‘MUST DO THIS SOON’. My notebook I hope will also serve as a great reference on how my blogging and knitting has developed not only over the past year but hopefully many more years and notebooks yet to come. It is a comfort to know that I always have this little book brimming with creativity in my bag with me, no matter how mundane a day I may be having, to help jot down my ideas and inspire me with some old ones. 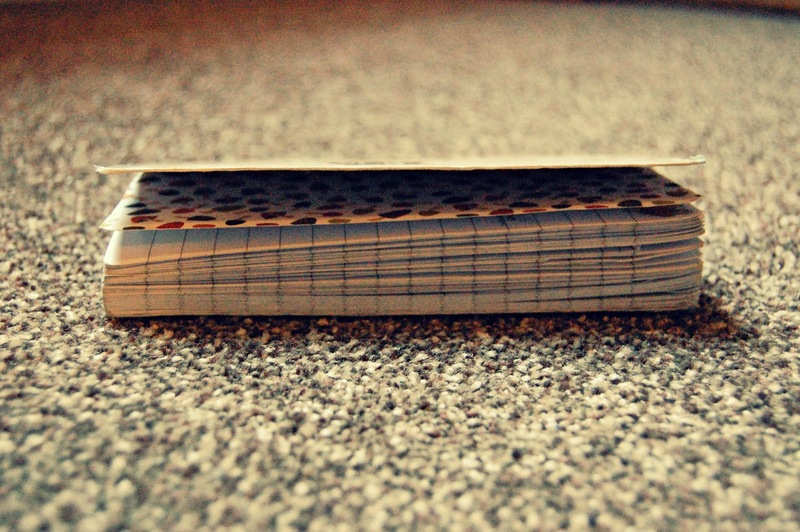 Do you keep a notebook in your bag, or perhaps do something similar? With this free crochet pattern you can make your very own amigurumi moogle, based on the ongoing characters featured in the Final Fantasy and Kingdom Hearts series of games. 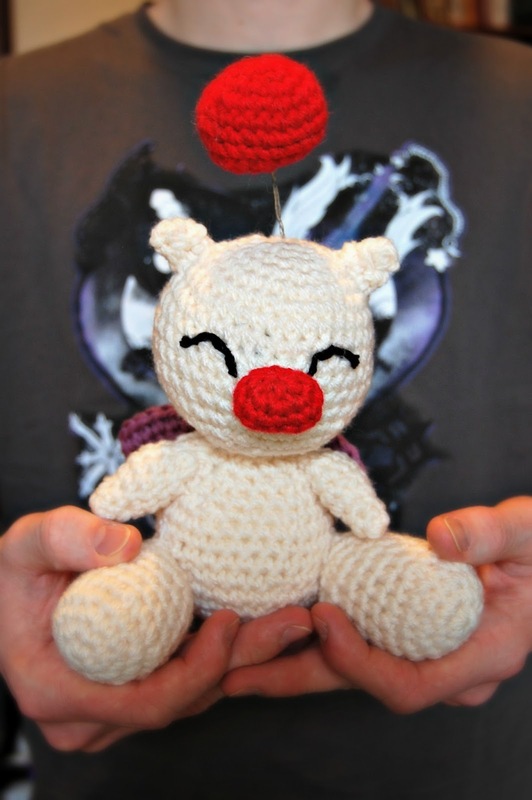 The moogle is so cute though you could probably get away making him for a friend who doesn't even play the games! And, as B's grandma pointed out to me, he has a red nose, perfect timing for Red Nose Day next week! Needle and embroidery thread in red and cream. Fasten off, leaving the top of the body open and a long tail to attach the body to the head. So I told you a couple of days ago that I had finished writing the crochet pattern for a full moogle, and that I was waiting to share it with you guys for a couple of days as I already posted a couple of new patterns last month. 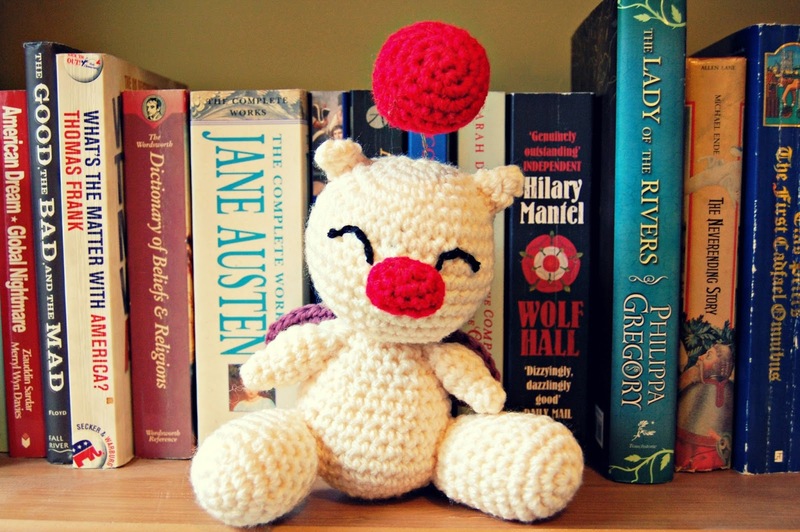 In the meantime I would like to share some pictures of the completed moogle so that you can decide whether you would like to make one yourself! modelled by the gorgeous B, also sporting his keyblade t shirt! 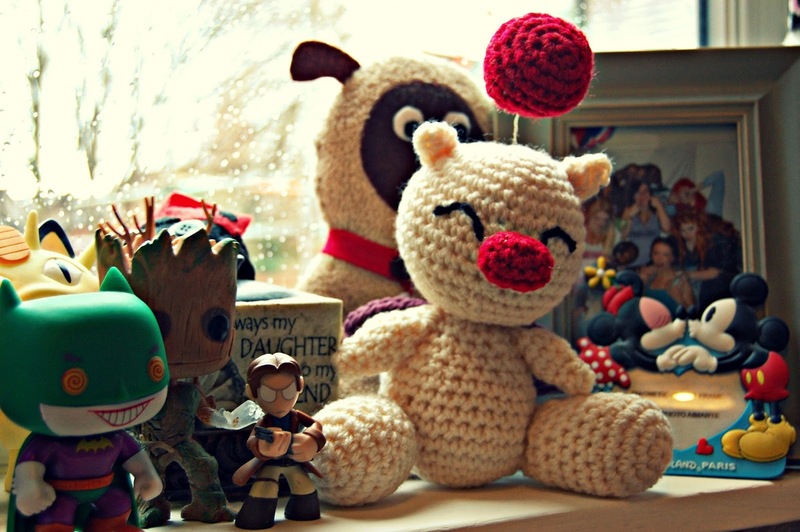 a cheeky peek of my bookshelf! I really hope you like the moogle and you agree he is rather cute! Writing a pattern for him has timed very nicely for the release of Final Fantasy Type-O later this year as well (I cannot wait - though I will need to buy a PS4...). Click here to watch a very exciting promo video for the new game! What do you think? Do you know anyone who would like a moogle? Last month I set myself 2 reasonably sized projects to complete, worried as I was that February might become like January with lots of unaccounted for commissions (not that I am complaining!). However last month I didn't receive any orders so I was able to get everything and more done, which was absolutely great; I really felt in my mojo with designing and blogging and just general creativity. So, in the hopes that this will continue this month, I am again going to set myself 2 craft challenges for the month ahead, but they are both of a good size that they shouldn't be too easy, but will also allow me to get on with other things that take my fancy, like knitting up another jumper. I really love how this sleeve looks, but I will probably go with another pattern - what do you think? I don't know if you recall that in November I actually put together a list of ideas from Pinterest of some great knitted and crocheted laptop sleeves, because I had just bought myself a lovely new laptop. 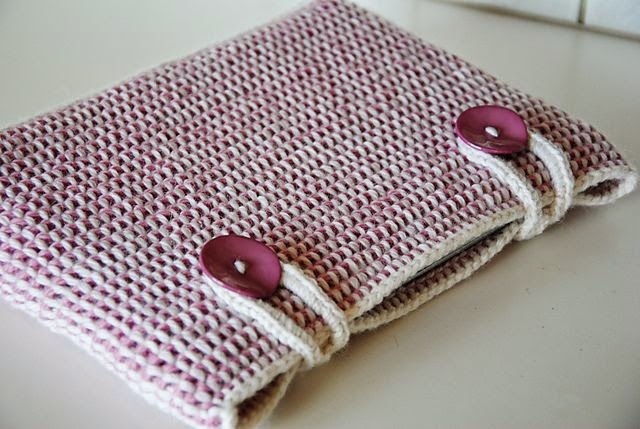 It is now March and I STILL haven't made anything, so I think it is high time I pulled my socks up and made one so that my laptop has more protection than it currently has. Have you set yourself any exciting projects or challenges for the month ahead?